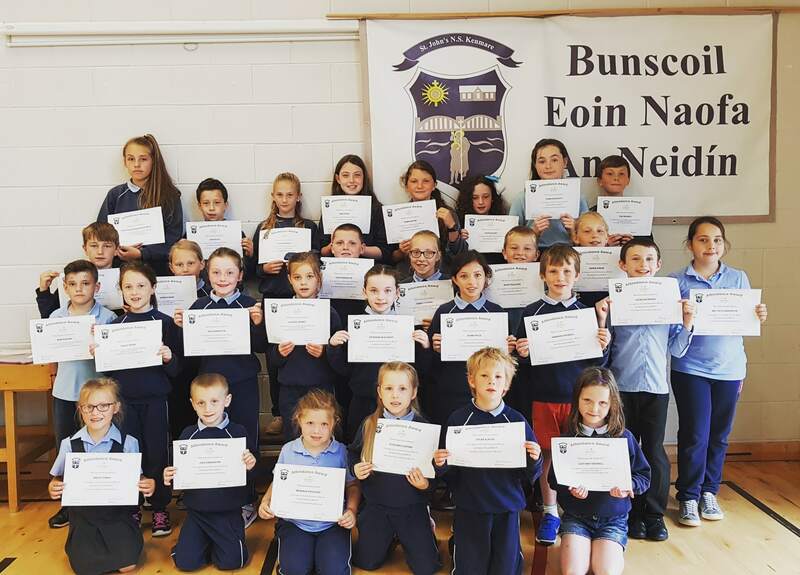 Best of Luck to our 6th Class who graduated on Monday. We had a lovely ceremony and send off and we wish you all the best in your future endeavours! Thank you to all the parents for your support throughout the years and thank you also to Tom Smith for the lovely photos. A great day was had at the Star Outdoors in Kenmare by our 4th Class on Thursday 22nd June. Thanks to all the staff for taking care of the children and making it such a fun-filled day with activities like archery, kayaking and more. Engineers Week is a week-long programme of nationwide events celebrating the world of engineering in Ireland. The aim of the week is to create a positive awareness of and spark enthusiasm about the engineering profession among young people with little or no engineering background. Engineers Ireland’s STEPS team coordinates Engineers Week and is responsible for the development of resources and materials, partner liaison and communication. Event hosts organise activities on a local level. Host organisations vary from engineering organisations to third-level institutions, libraries and educational centres. Here are the Engineering Projects by 4th Class this year. Junior and Senior Infants along with some helpers from older classes went on a lovely Teddy Bear’s Picnic on Wednesday. A fantastic end to the year! We hope you all have a happy and sunny Summer. Holidays Tuesday at 12p.m. This year, we made a special effort to promote neatness in handwriting and other areas. Good handwriting promotes motor and cognitive skills as well as contributes to reading fluency and activates visual perception skills. The children were all on board and tried their best to maintain their tidiness or improve upon it. Today, at Assembly, Mr. Courtney presented a gift to one person from each class for their efforts at being neat this year. Well done all! Well done to all the children who received awards today for Attendance this year! We had 21 children who missed no day this year and got awards for Full Attendance. 10 children missed 1-2 days and received awards for excellent attendance. This is a highly commendable achievement. Keep up the good work! In the Autism Unit, we practice integration into mainstream classes in order to promote social skills and inclusion. This has beneficial effects for both the child with Autism as well as the Mainstream Class child as it teaches the child with Autism how to play, socialise and make friends as well as teaching the Mainstream child the value of kindness, friendship and consideration. This year, we were particularly impressed with the level of kindness by the children on the yard and in the classroom to children with Special Needs. 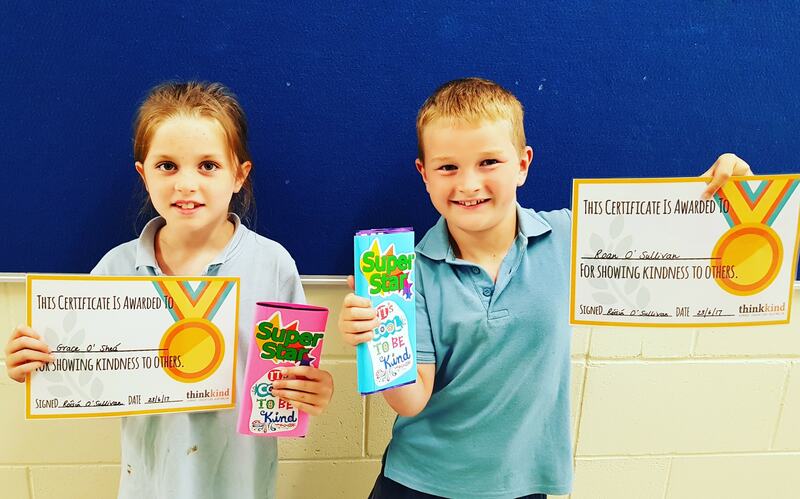 Well done to Grace O’Sheá and Roan O’Sullivan for going the extra mile with kindness and consideration as well as all the other children who tried so hard to put a smile on other’s faces. No act of kindness is ever wasted. Anyone with outgrown school uniforms they want to pass on can do so this Monday! The Parents Association will take in donations of Outgrown School Uniform Clothes on Monday morning and sell them in the school hall in the afternoon. Uniforms can left in to the school hall from 9am to 10am. The sale will be on in the hall from 1.30pm to 3.30pm. Uniforms will be sold on at good value prices. All funds earned will go towards buying books for the School Library. St. Johns will run a Summer Camp in July. Details are outlined below. We also have details of more Summer Camps on the notice board inside the front door of the school. Brochures can be picked up from the school office. Closing for Summer Holidays: Tuesday, June 27th at 12 noon. Parents will shortly be receiving a Report Card giving details of their child’s progress during the school year 2016/17. Following a lot of work and planning a comprehensive Book Rental Scheme is now operating In St John’s N.S. and a large number of books are available for rent. Each book can be rented for €3 – €5 per year and is then returned to the school at the end of the school year in June. We encourage you to participate in this Rental Scheme as it will serve to reduce the overall back to school costs. You will receive your child /children’s Booklist for the school year 2017/18 in the coming days. Class Booklists will also be available on our website www.stjohnskenmare.ie Once you have decided on books you wish to rent please put all Book Rental Money in an envelope marked “Book Rental” and give to class teacher in September. Please include name of child and books you wish to rent. Please note lost or damaged rented books or library books will incur a fee. The school fee for Arts and Crafts and optional Insurance is included with our Book Lists and should be paid to class teacher in September. 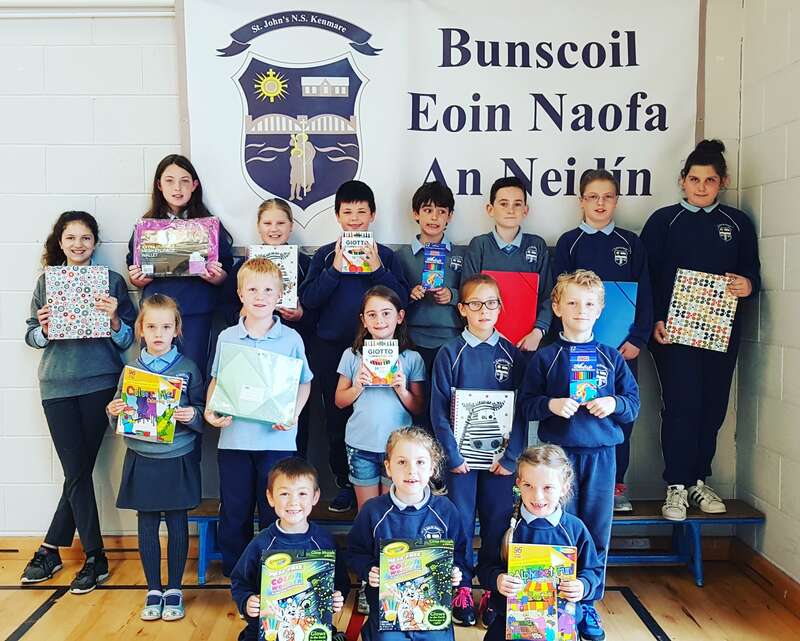 A family fee structure is in place and charges of €20 for 1 pupil, €35 for families with 2 pupils, €50 for families with 3 pupils and €60 for families with 4 or more pupils. Please give the fee to your oldest pupils’ teacher. Regarding optional Insurance, we strongly advise you to avail of the Allianz Primary School Pupil Personal Accident Insurance for the school year 2017/18. Please read the information sheet accompanying your child’s Book List giving details of cover provided by this policy. By now all the uniform order forms are being processed and will be available for you to collect on distribution day Friday, August 25th from 12.00 noon – 5.00p.m. in the school hall. Please note shirts, trousers, skirts and pinafores are now available in the main department stores at competitive prices. Please be conscious of our Uniform Policy when purchasing school footwear during the summer period. On designated P.E. days, pupils are allowed to wear their school tracksuit and regular runners. On all other school days, pupils are expected to wear their full school uniform with black/dark footwear. We kindly ask you to respect this policy in the interest of uniformity and an effort to minimise competitiveness in relation to coloured/ designer sports footwear. As the majority of schools operate this policy Department Stores are offering competitive prices on regular school and sports footwear. 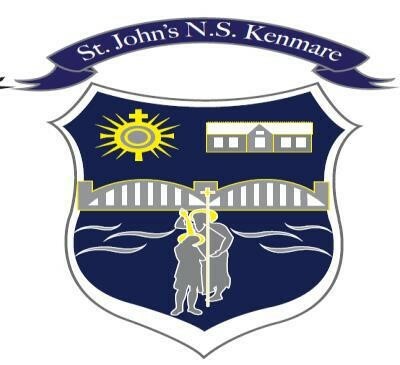 Well done to Mr. Hussey and Mr. Devane and all the sixth class pupils who fundraised for the Kerry Hospice Society in Kenmare on June 9th. Congratulations and best wishes to teacher Louise Downing who is getting married in July. Best of luck to Louise and Maurice! Congratulations to SNA Alanna McCarthy on the birth of a baby boy Florence. Congratulations Alanna and Flor! St. John’s N.S. 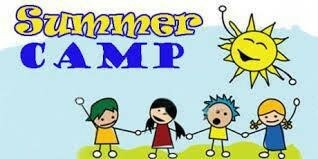 Summer Camp runs from July 10th – 14th catering for pupils from 2nd – 6th class. Activities include Basketball, Badminton, Boules, Futsal Soccer, Tennis, Pitch and Putt, Rounders, Rugby, Spike ball, Table Tennis, Cycling, Orienteering, Arts and Crafts and Science Activities. The cost is €60 per week. Reductions for families. 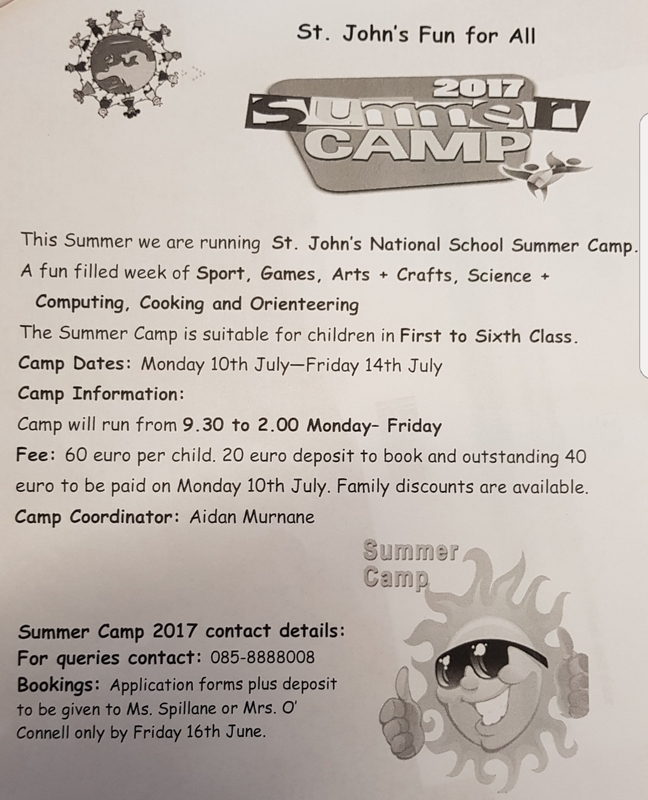 Application forms available from the school with further information on Facebook page: St John’s Summer Camp. 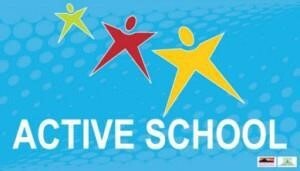 We are delighted to announce that we have been awarded the Active School Flag for striving to achieve a ‘physically educated and physically active school community’. The flag was raised on Friday, June 16th and we would like to convey our gratitude to Tadhg Morley and Seán O’Shea from the Kerry Team also Amy Harrington and Aoife Crowley who are on the U14 Kerry Panel for their presence at the ceremony. Much hard work went into the achievement with special thanks to all our teachers, pupils and our Active School Committee Darren Allman, Adem Gul, Grace Foley, Gemma Myer, Finn Murphy and Mark O’Regan for their commitment all year. Well done all! Food Dudes is a Healthy Eating Programme which all classes took part in during the last term. It aims to encourage children to eat more fruit and vegetables. 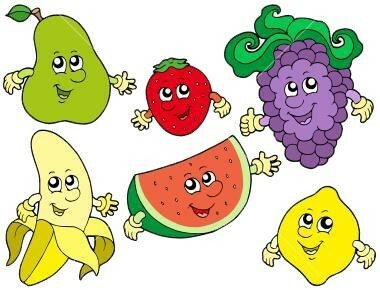 The children received rewards and stickers for trying new fruit and vegetables and were encouraged to bring fruit and vegetables in their lunch boxes as part of their daily diet. Well done to the children for trying the new foods as well as to all parents for continuing the encouragement at home! This year, St. John’s N.S. took part in a Health Promoting School’s Initiative. We committed to becoming healthier as a school as well as creating an awareness of the importance of both physical and mental health. This is a two-year process and we are very pleased to say that we have been awarded with certificates for outstanding achievement for the current year and will strive to continue the hard work next year and hopefully be awarded with our Health Promoting School’s Flag! Well done to teachers, students and the Health Promoting Committee for all their hard work in maintaining a healthy school. St. John’s N.S. has been awarded the Discovery Primary Science and Maths Award of (STEM) Excellence 2017. Pupils in each class engaged in STEM activities and workshops throughout the year, which contributed to the improvement of skills including critical thinking, analyzing, estimating, measuring, fair testing and recording. This is a great achievement for our school. Congratulations to all! We hope that we have been keeping you well updated with happenings in St. John’s N.S. on our new look website and Facebook page. Keep an eye especially on our recent events section which give details of events as they happen including photos. A special word of thanks to our website coordinator, Roisín O’Sullivan for all her hard work in recording and uploading all the information and photos. In order to facilitate our Parents Association initiative to collect outgrown uniforms and unwanted books suitable for school libraries, parents are being asked to drop in these items to school from 9a.m. – 10a.m. on Monday June 26th. Uniforms collected will be on sale in the school hall from 1.30p.m – 3.30p.m. on Monday June 26th. Any books donated will be given to class libraries. We would appreciate if any new or changed numbers are forwarded to the school for ‘text-a-parent’ purposes. Best wishes to the 45 – 6th Class girls and boys who are leaving us. On behalf of all the Staff, I wish you all a safe, healthy and enjoyable summer. Thank you all once again for your help and co-operation.